64 pages. Illustrated throughout. Hardcover with dust jacket. Published on the occasion of the exhibition Eggman II. This exhibition is comprised of nine paintings, a group of drawings and one sculpture which date from the three years before Kippenberger’s premature death in 1997. 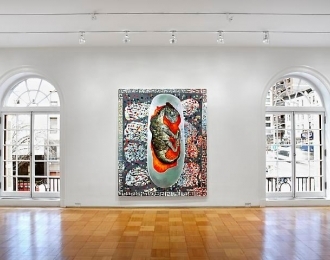 This exhibition included Kippenberger’s paintings, hotel drawings, as well as found and collected objects organized around the theme of the egg. Eggman II continues this exploration of the egg, one of the central motifs that Kippenberger revisited throughout his oeuvre. Kippenberger employs the egg as a playful parody in his paintings and sculptures making indirect references to rebirth, reproduction, and the ideal of the circle.